The Niger State Police Command has arrested a 25-year-old man, Aliyu Mohammadu, for allegedly cutting off his cousin’s manhood. It was learnt that Mohammadu, from Babana Borgu, in New Bussa Local Government Area of Niger State, allegedly attacked his cousin, Farouk Ibrahim, on the claim that Ibrahim was unruly. It was gathered that Mohammadu also accused his cousin of stealing N3,500 (three thousand, five hundred naira only) , which he claimed to have kept in his room. “My cousin was rude to me after he made away with my N3,500. When I confronted him on the way to the farm, he told me not to disturb him, insisting that he did not take my money. “I got annoyed and attacked him with my cutlass, which resulted in the cutting off of his manhood,” Mohammadu told Punch correspondent. Mohammadu added that he needed his money, threatening a further attack on Ibrahim. He said, “What I need is my N3,500, otherwise I am going to do more harm in the family. 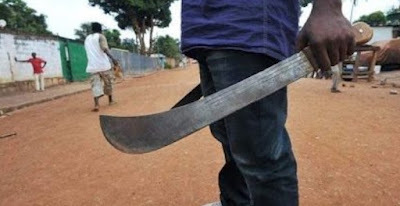 The Police Public Relations Officer in Niger, Peter Sunday, confirmed that police operatives in New Bussa Division arrested Mohammadu for cutting off his cousin’s manhood. Sunday explained that the suspect attacked his victim when he was taking food to his father, Ibrahim Mohammed, on the farm. “Mohammadu attacked his cousin with a cutlass and cut off his manhood. “The victim was rushed to one specialist hospital in Ilorin, Kwara State, for treatment,” the PPRO said; adding that Mohammadu would be charged to court as soon as investigation is concluded. » Unable To Pay For Surgey, Man Cuts Off His Feet To Get Rid Of Pain.